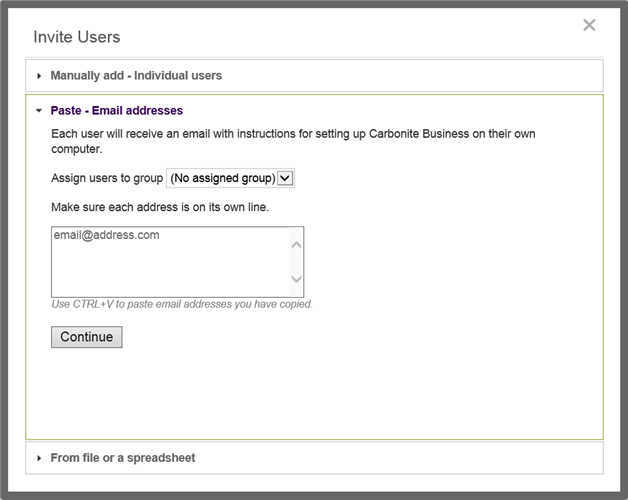 You can manage users and administrators from your Carbonite Safe Pro account. There is no limit to the number of users or administrators that you can add. You can also remove any users or other administrators from your account, excluding the current Billing Owner. You can add users and/or administrators to your account through your Dashboard. An administrator has more functionality than a user and can manage other users and administrators within the account. Please choose one of the options below to add users and/or administrators to your account. Sign into your Carbonite account as an administrator at https://account.carbonite.com. Once signed in, you will be at your company's Dashboard. Click Invite others to back up and a window will pop up allowing you to add users and administrators to your account and select a group to place them in. You will be taken to the Manually add - Individual users section. If you are viewing a group when you try to invite users or administrators to your account, they will be associated with the group you are viewing. Type the proper information into the fields provided for the users and administrators. To add an administrator to your account, select Administrator from the list box. Click Continue to send your invitations. 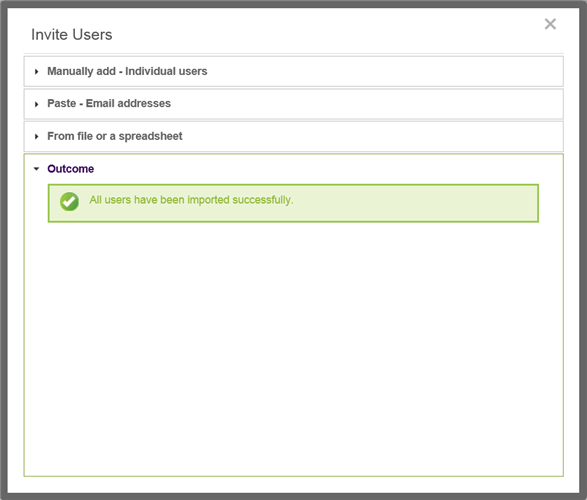 You will receive notification within the Outcome section, once all users and administrators have been imported successfully. The user(s) and/or administrator(s) will receive email instructions to set up Carbonite on their computers. 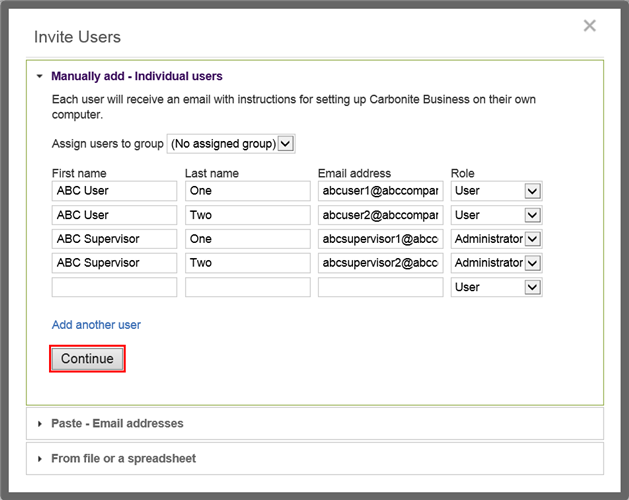 The example above shows a sample email for an administrator role. The user/administrator should select Click here in the email to complete their account registration. Once signed in, you will be at your company's Dashboard. Click Invite others to back up and a window will pop up allowing you to add users to your account and select a group to place them in. Select the Paste - Email addresses section. 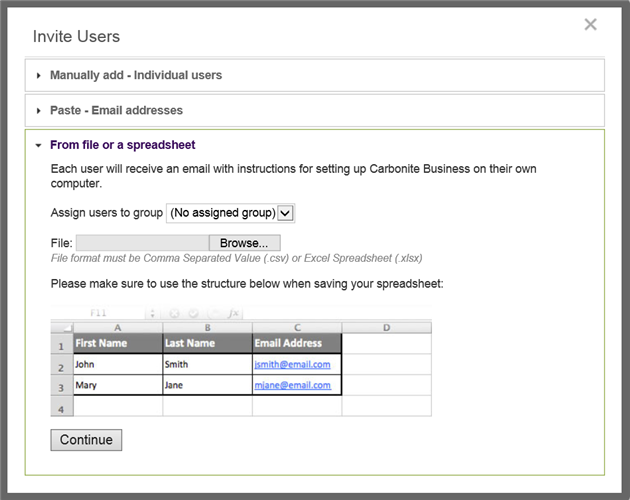 Paste the email addresses into the field provided for the users and make sure each address is on its own line. Click Continue to send your invitations. By default, any user invited to your company using this method will be a standard User. There is currently no option to invite an administrator using this method. You will receive notification within the Outcome section, once all users have been imported successfully. The user(s) will receive email instructions to set up Carbonite on their computers. Once signed in, you will be at your company's Dashboard. Click Invite others to back up and a window will pop up allowing you to add users to your account and select a group for them. Select the From file or a spreadsheet section, and click Browse to locate the file or spreadsheet that contains the email addresses for the users you are inviting. If you are viewing a Group when you try to invite users to your account, they will be associated with the group you are viewing. Navigate to the location of the file within the Choose File to Upload window. Once the file has been located, select Open to upload it. Click Continue to send your invitations. 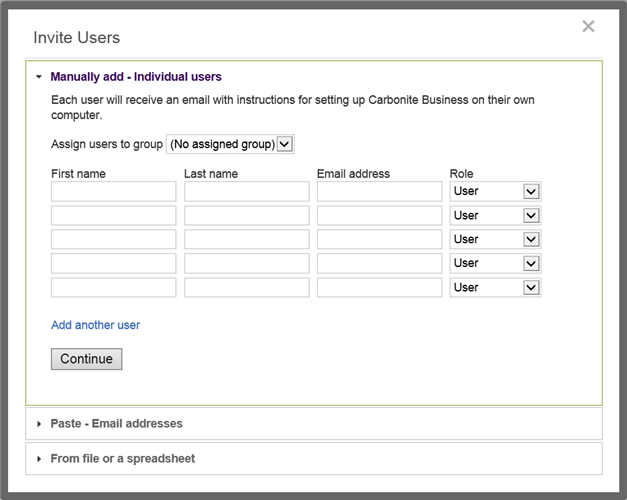 An administrator can remove any users or other administrators from the Carbonite account, excluding the current Billing Owner. Sign into your Carbonite Safe Pro account as an administrator at https://account.carbonite.com. Within the Dashboard, select the user or administrator you wish to remove from your account. 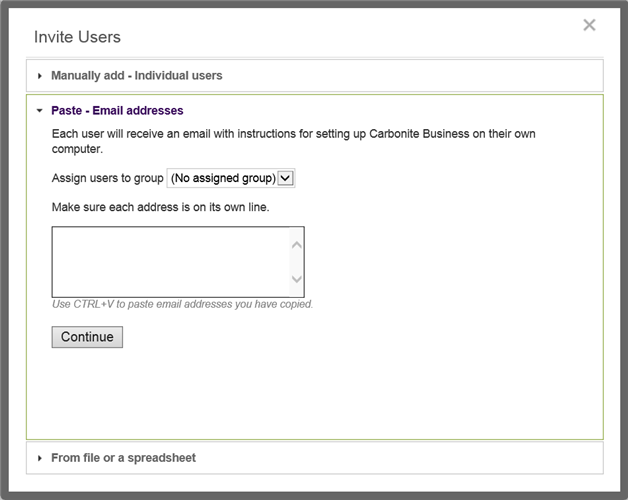 To delete the user from your Carbonite Safe Pro account, click Delete User under User profile actions. You will receive a pop-up message to confirm your actions. Warning: Any computers associated with the user will be deleted when the user is deleted. This action CANNOT be undone. Click Yes, delete this user to remove the user from your account.